After discussing Good and Better Soundproofing, it should be no surprise that the Best Soundproofing solution combines both decoupling, damping and materials of different densities. We have already shown that these three components are the foundation for predictable, proven results; we will now show that when combined they can deliver truly remarkable results. You can actually save money over conventional methods used to obtain STC values in excess of 55. Rather than two sets of studs, or room within a room construction, simply use our proven products, in single stud framing. Where "the best" Home Theater, Multi-Family or Commercial walls between tenants are required, the "old school" methods are based on multiple studs, wider more expensive base plates and headers, and "packing it full of insulation". While these methods can produce better than average results, they fail at the critical frequencies, take up usable space, and add to the cost of the project. Our challenge is to obtain better walls, that will produce not only higher STC values, but more importantly with be more effective at the most critical frequency ranges. The use of single studs, regular fiberglass, and truly effective soundproofing products will create walls that are much quieter in the real world; cost less, and save space. 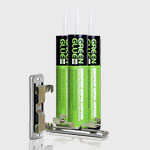 By using both ISOMAX Clips and Green Glue you will be using two proven technologies; sound isolation by decoupling, and sound damping which converts vibration energy into low grade heat. This particular combination will eliminate the need for double stud or staggered stud wall construction. The sound reduction across all frequency bands is remarkable with this proven system. The tested value of the assemblies below will support the previous statements. Where additional space to construct a better wall is the biggest challenge, we have some solutions that will minimize the build up, and provide very good results. More on this topic. STC isn't everything! One of the challenges we face as a company is the re-education of our customers regarding the effectiveness of a soundproofing system rather than the STC value alone. A high STC value does not necessarily mean you will actually get high sound blocking for your application.